Christmas is right around the corner and maybe you’ve been pondering adding in some new traditions or thinking about simplifying the ones you already have. This post contains Amazon affiliate links. I may make a small commission if you click on them at no extra cost to you. Thanks for supporting my blog! I asked my girls the other day what their favorite traditions are. They loved the simple ones the best! you can start with your family this year! Make sugar cookies together and decorate them! My mom always did this with us every year and I continued this tradition with my own kids. This can seem like a lot of work if your house has toddlers and babies in it, but I promise- it’s worth it! In a few short years, they’ll be able to take on more of the actual mixing, baking and decorating, leaving you with the primary job of photographer to capture it all! You have festive cookies, fun quality time, and an easy, inexpensive, old fashioned Christmas tradition! Roll out on floured counter or parchment paper until about 1/8- 1/4 inch thick. Cut into fun shapes using cookie cutters. Lay on sprayed cookie sheet. Raise oven rack so it's one higher notch above the middle setting. Bake at 400 degrees for 6-7 minutes. Read the Christmas story out of Luke and Matthew. We do this on Christmas Eve, but you can also do this on Christmas morning. Grab a Bible, lounge around the livingroom, and pick a reader (or take turns!). Simple, easy, good for the soul, and it’s a great reminder of the TRUE reason that we celebrate Christmas in the first place. Give the kids new pajamas on Christmas Eve. I’m sure you’ve seen this one floating around the internet. We started this long before pinterest and facebook were around, though! You can make this as easy or as complex as you want. The more complex version is where you actually sew the pjs yourself (which my sister and I do/did for our kids!) or you can go the easy route and just buy them (which I started doing last year because my kids got too big to easily buy enough fabric for!). I found these on Amazon and Lindy loved them! They’ve held up very well, too 🙂 Watch for sales at the end of winter and buy them in advance for easy money savings! Attend church together on Christmas Eve. We did this for many, many years until it got to be too overwhelming for Reece. This is another one of those traditions that you can make more elaborate or keep simple. The extra elaborate version is where you sew the girls matching dresses and the boys wear matching shirts and ties (this is what my mom did every year! But she loved to sew and was awesome at it!). The easier version is buying special outfits for the family to wear that night and doing your girls’ hair all super cute. God doesn’t really care what you’re wearing, but if matching outfits are your thing, then go for it! Put together an Operation Christmas Child shoebox. This charity organization is near and dear to our hearts! This is something that takes more thought and planning and has to be completed by the drop off date (middle of November), but it is so satisfying knowing that you’re helping children and furthering God’s kingdom! *Sidenote- the collection week is this week! November 12-19, 2018- so pack your box and find a drop off location! Our whole church is now involved in this, so we don’t make our own shoeboxes at home anymore- we donate items to our church and then participate in our big packing day. Look into it- it’s an awesome way for even young kids to give to those less fortunate. Light candles and sing “Happy Birthday” to Jesus on Christmas morning. I make homemade coffee cake for our Christmas breakfast, but use whatever breakfast you want that will hold a candle. Each kid gets one candle in their breakfast food, we light them, sing the song, then they blow out the candles. So simple, yet is another great reminder that we celebrate Christmas because of God’s Son. Pick an easy supper to prepare Christmas Eve and make it every year. My mom always made chili on Christmas Eve. Sure, we had chili all throughout the winter, but there was something special about the chili on Christmas Eve, you know? Pick whatever you want, but if you make it a point to always fix that meal on Christmas Eve, it will take on a magic all it’s own. Use an advent calendar with your kids. If you search for advent calendars on Pinterest, you’ll get a million ideas. This is one of those traditions that can be easy and basically free, or expensive and elaborate. Pick whatever works best for your family! We use a quilted advent calendar (You can check out my post about it and get my free printable diagram and instructions!) that I made modeled off of the one my mom had for us when we were kids. Other than the time and money I initially put into it, it’s an easy and free yearly tradition that the kids always look forward to! Decorate the house as a family. I know some of you might like to go all out, but in our family, our primary decorations consist of a tree, stockings, and a couple nativity sets. I don’t care how you decorate, but do it as a family! My girls go over to their grandma’s house every year to help her decorate, too, and it’s a tradition they all love. Cut out paper snowflakes together and hang them from the ceiling. We don’t necessarily do this every year (depends when we get done with fall harvest! ), but when we get a chance, it’s always fun to get out the scissors and paper, turn on some music and start cutting away! We use white thread and scotch tape and then hang our creations from the ceiling in between the kitchen and livingroom. It’s a cheap, inexpensive way to add a bit of fun decor and spend more time together as a family without spending hardly any money! 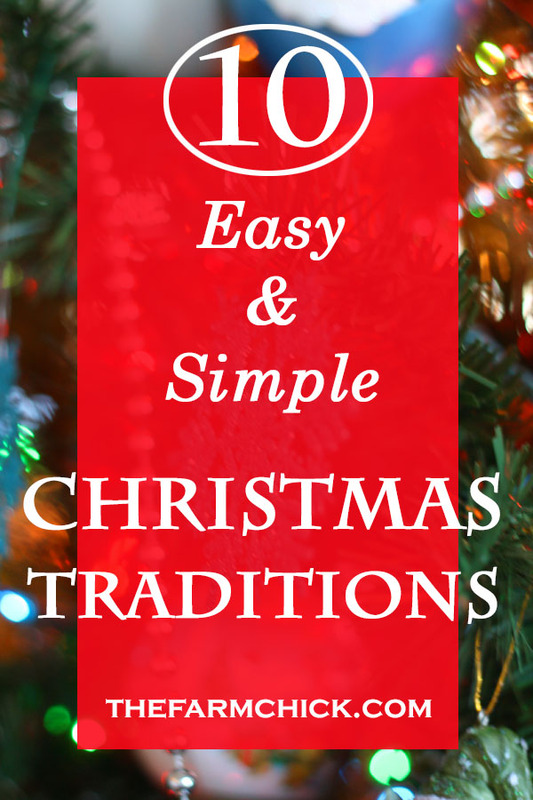 Easy and inexpensive Christmas traditions that you can start with your own family this year!